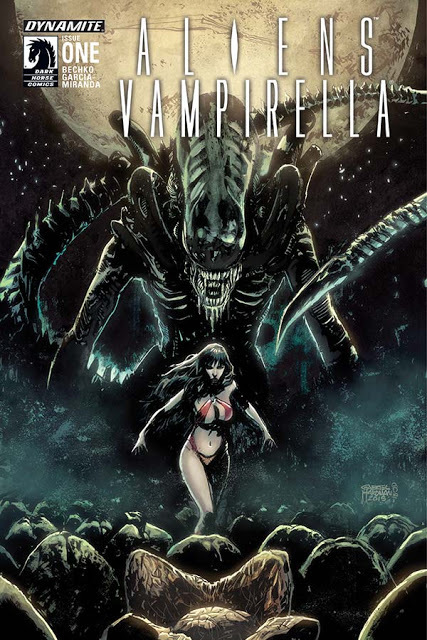 Before you balk at this latest Aliens crossover, this time with the vampire heroine Vampirella, 'Aliens/Vampirella' #1 is a surprisingly faithful sci-fi thriller to the film franchise that spawned it. Writer Corinna Bechko is a fan of the space horror classic and it shows with her careful world building that feels like an extension of the movies. The series is off to an exciting start with the kind of suspense you'd expect from a comic with the 'Aliens' name attached. So how exactly do you get the famously scantily clad but powerful vampire into space in the first place? More importantly why? A crew aboard a Mars station on the newly colonized planet has run into some mysterious catacombs underneath their station that only Vampirella's expertise can help them comprehend. She lands on Mars after hypersleep and quickly looks to get to the bottom of their discovery. Bechko wastes no time in introducing the crew and getting right down to business. The pacing is quick but not rushed. She does away with exposition in the normal sense instead of opting to have it come from the crew's debriefing of the situation to Vampirella as well as the reader. She takes the fan-friendly approach of eschewing a long set-up and getting right to the good stuff, the alien pods. Javier García-Miranda and InLight Studios give the story the dark, eerie atmosphere it deserves. Garcia-Miranda shines with the alien designs. We've seen it before but he creates great depth with detail work and InLight's color composition heightens the terrifying texture and menace of the alien's jaws. 'Aliens/Vampirella' #1 really is an Aliens story so far as it quickly establishes the danger and gives sci-fi fans what they crave from the beginning.